This is a common change that players make when they have throwing accuracy problems. They go to a safe throw, a blooper, or softer throw. What do other players do when trying to improve throwing when they lose accuracy? Making mechanical changes or going to a safe throw will not help you address the real issue: Fear of making a bad throw at the wrong time. 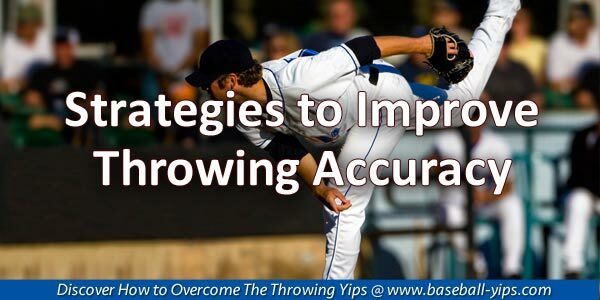 But that’s how most players will try to improve their throwing… However, changing the throwing action mid-season can cause more harm because you start to over think it. The problem is that when you have throwing problems, you feel like it’s a physical issue. So players will try to address it with a physical change, such as focusing more on the release. And this leads to over control and too much thinking… Just what you don’t need to improve your throwing. If you have full command of your throwing during practice—when alone at home or with your teammates—but lose control when you scrimmage or play in a game, the problem is a mental game issue! You won’t find it in positive thinking or visualization. These are band aids to the real issue. The real issue is over control or lack of trust in your arm due to fear of failure. 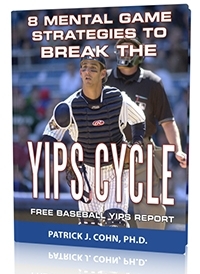 90% of the players I work with on the throwing yips, are scared about what others think. My ball players worry about what coaches, teammates, and parents will think if they make a bad throw. All this leads to outcome thinking, worry, tension, and trying too hard. In Anthony’s case and many other ball players, it leads to going to a safe throw. Let go of worrying about the negative outcome. Let go of what others think if you miss a throw. Stay in the moment while throwing. Focus on the right performance cues during play. Go back to throwing on instinct. I help players with all these tasks to improve their throwing. Personal mental coaching via phone, Skype, or in person (return this email for more details of the program). 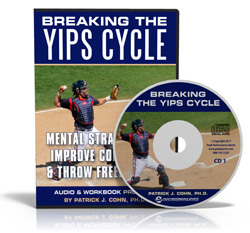 “Breaking the Yips Cycle” audio and workbook program (see below). I have had a rough time this summer throwing the ball back to the pitcher when I’m catching. It really starts to eat away at me outside of baseball. There’s only two games left in the season but I’m scared this will come back next year. You want to work on freeing up your arm when throwing and not going to the safe throw.